I don’t always make my own dough… Sometimes I like to make pizza on a beautiful focaccia bread. Since the garden tomatoes are so plentiful, I was hungry for just this kind of pizza. Preheat the oven t0 375 degrees. Place the bread in a cast iron skillet. 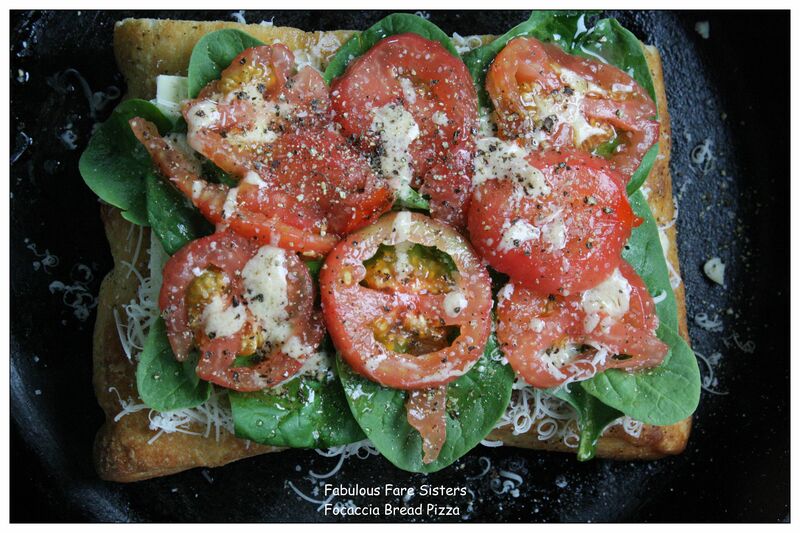 Layer the cheese on the bread. Place the spinach and basil next and then the sliced tomatoes. Sprinkle with some olive oil, garlic and salt & pepper. Bake for 20 minutes. Ooey Gooey goodness! Delicious! You’ve just reminded me that I haven’t made focaccia in too long! We would love to hang out and eat this pizza with a glass of wine of course!